Our IHAWKe (Indigenous, Hispanic, African American, Women, KU Engineering) students are seeking to use AI to help people with dementia and their caregivers. Some of these students have grandparents that have suffered from this illness and know firsthand the pain it can cause and are determined to use AI and machine learning to transform how people around the world experience dementia for the better. This team is diverse not only because they are members of NSBE, SHPE, SWE, and KU Women in Computing but also because the are studying different fields of computer science, mechanical engineering, information technology, electrical engineering, and architectural engineering. Later this month this team of diverse KU engineering students will compete against other teams in the National Academy of Engineering U.S. Nationals (West) for the Global Grand Challenge Summit Student Competition in Irvine, California. Thanks to a grant from the National Academy of Sciences and Engineering along with sponsorship from Lockheed Martin Corporation our students will be competing with teams from other universities for a chance to participate in the global competition in London during the Global Grand Challenge Summit this September. Whether or not they win, our students are learning how to do customer discovery, create a business model, and prototype an AI solution that may help transform how people with dementia and their caregivers interact with each other and the environment they live in. About the Author: Dr. Andrew B. Williams is the Associate Dean for Diversity, Equity, and Inclusive and Spahr Professor of Electrical Engineering & Computer Science at the University of Kansas. Dr. Williams began and now directs the IHAWKe (Indigenous, Hispanic, African American, Women, KU Engineering) program and building on the 40+ year old Diversity and Women’s program at KU Engineering that first gave him an introduction to engineering several years ago as a first-generation, low-income college student. Copyright 2019 Andrew B. Williams, Ph.D.
Last week at the National Society of Black Engineerings (NSBE) 2019 National Convention in Detroit, according to Karl Reid, NSBE Executive Director, there were over 15,000 participants. During the NSBE Dean’s Forum, Dr. Gregory Washington, Dean, UC-Irvine, noted that the overall numbers of high school graduation rates are projected to fall in various states. This will present a challenge for universities seeking to recruit high school students into their engineering and computing programs. More information on these statistics can be found in an article by Rick Seltzer in Inside Higher Ed. The good news is that the high school graduates will be more diverse. Another speaker at the NSBE Dean’s Forum, Dr. Scott Page, University of Michigan, author of the book the Diversity Bonus, argued effectively how and why diverse teams lead to better outcomes. One example came from a paper in Nature that showed that papers with four or five authors from multiple ethnicities have 5-10% more citations than the mean number of citations for a given publication. Our IHAWKe (Indigenous, Hispanic, African American, Women, KU engineering) program at the University of Kansas School of Engineering, is seeking to address this problem by exposing and engaging diverse and low income students from high schools that traditionally are not targeted for engineering recruitment. That’s why yesterday we invited seventy ninth graders from Washington High School in Kansas City, Kansas to visit KU Engineering, interact with our IHAWKe students, participate in design activities and learn about admissions as part of our KUEST program, sponsored by Halliburton and ExxonMobil. We are seeking to engage and recruit these middle school through high school through first year in college students by working with their teachers, parents/guardians, and administrators. After all, as Spike Lee was once quoted saying, talent can come from anywhere. What if students from underresourced schools with diverse populations saw themselves as technology creators and inventors? 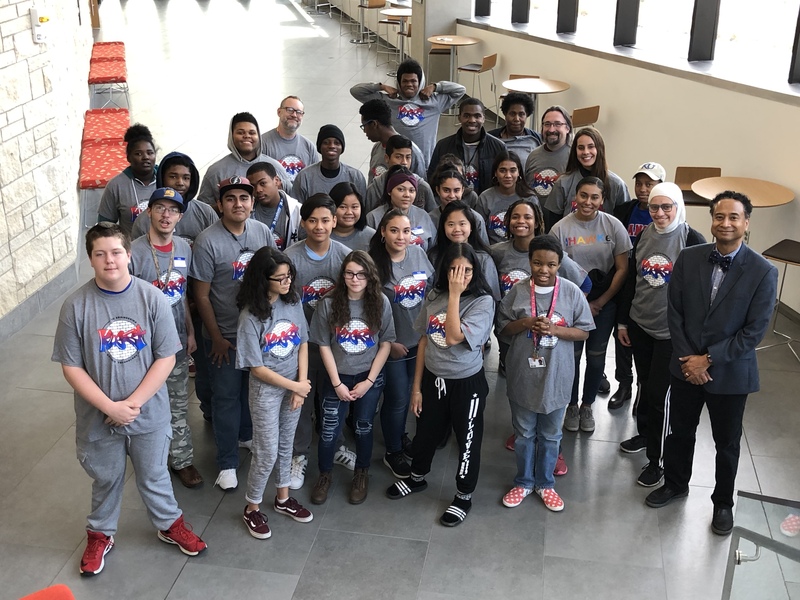 Last week we invited 24 sophomore students from Kansas City, Kansas Schlagle High School to participate in our KUEST 10 program for a hands-on experience in computer programming and design thinking for community needs. These students had participated in our KUEST 9 program last year with about 280 other high school students. Some of the topics they tackled using their imagination and creativity were gun violence, crime, lack of school funding, poverty, and discriminating stereotypes. How did they prototype an engineering solution to tackle gun violence? Going through the design thinking process starting with empathy, they were able to brainstorm and come up with a solution. They “invented” and prototyped sensors for guns that would track when someone picked up a gun, the location of the gun, and the shots fired. These sensors would then be sent to authorities that monitor violence in their community and can respond with help if needed. Only three of the 24 students had experienced writing a computer program before. On this day, they learned how to write a program to calculate the future value of an investment of part of their salary as a future engineer using the Python programming language. The KUEST 10 students were shown how becoming an engineer and using their salary to invest in a retirement plan could very feasibly result in them retiring a millionaire. Not only did they learn the value of writing computer code, they saw its application to reducing poverty! 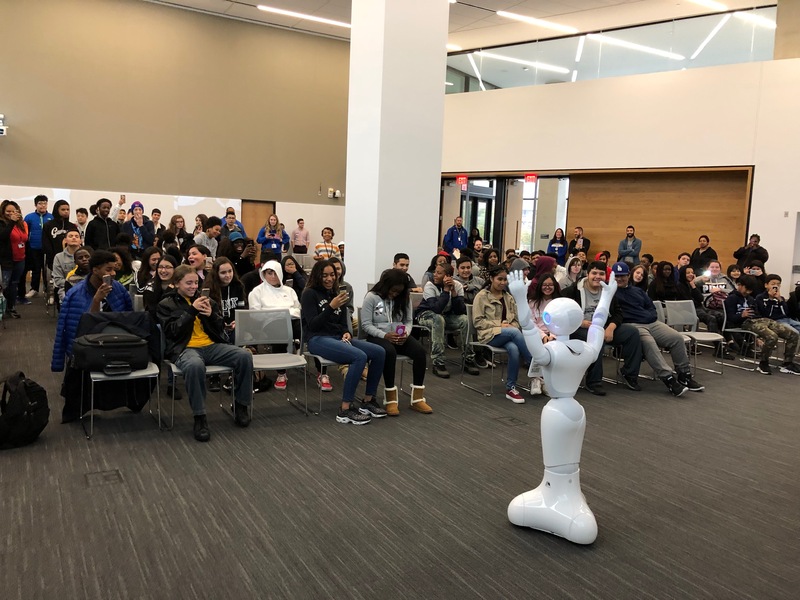 The KUEST 10 students got to meet and interact with their first social robot. They were introduced to the concept of programming artificially intelligent robots, the Jibo, using the Scratch programming language. After all, in their lifetime, these students will live with autonomous robotic cars. Shouldn’t they understand how robots are programmed and have jobs that involve them designing and using robots? Seeing themselves as creators of technology and unleashing their imagination through prototyping and programming is one of the best gifts these students and anyone else could ever receive. Acknowledgments: Special thanks to Halliburton for funding this program. Copyright 2018 Andrew B. Williams, Ph.D. Talent competency – being mentored in research and creative design experiences. Our IHAWKe Diversity and Women’s Programs is aiming towards participating in the Grand Challenge Scholars program to equip our students to solve the energy, infrastructure, health, sustainability, water, and other grand challenges for our future. It will take a diversity of ideas, experiences, skills, and backgrounds to do that. That’s why we continue to believe and nurture diversity in our engineering and computing students. Because diversity inspires innovation that will change the world. About the Author: Dr. Andrew B. Williams is the Associate Dean for Diversity, Equity, and Inclusive and Spahr Professor of Electrical Engineering & Computer Science at the University of Kansas. Dr. Williams began and now directs the IHAWKe (Indigenous, Hispanic, African American, Women, KU Engineering) program and building on the 40+ year old Diversity and Women’s program at KU Engineering that first gave him an introduction to engineering several years ago as a first generation, low income college student. 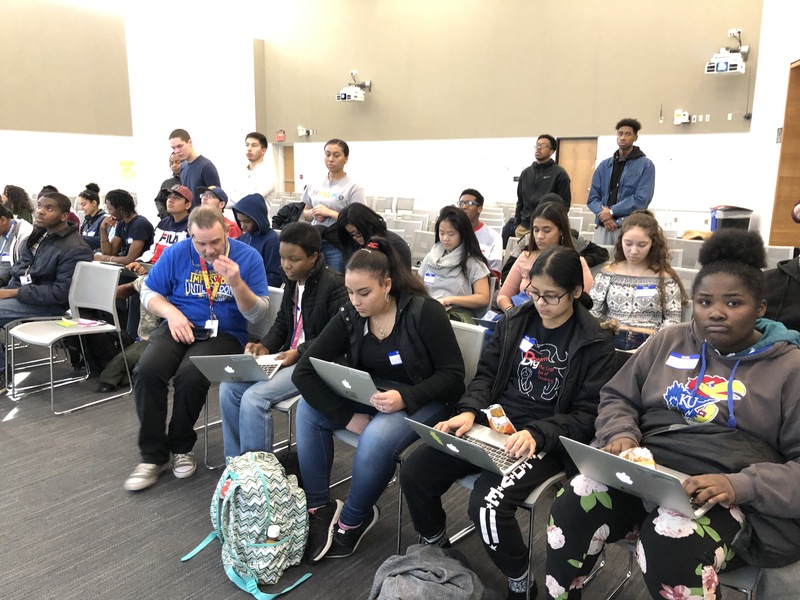 “I want you to now design an app that will meet the community needs you identified.” When I shared that to the group of around 160 ninth graders from Kansas City Kansas Schlagle High School, I could see it in their eyes. “You want ME, to design this app?” The boys and girls began to straighten up in their chairs. The looks in their eyes had looks of expectation and curiosity. I wondered how many of them pictured themselves as creators of technology before I gave them the opportunity to do so in a low-fidelity app prototype design exercise. 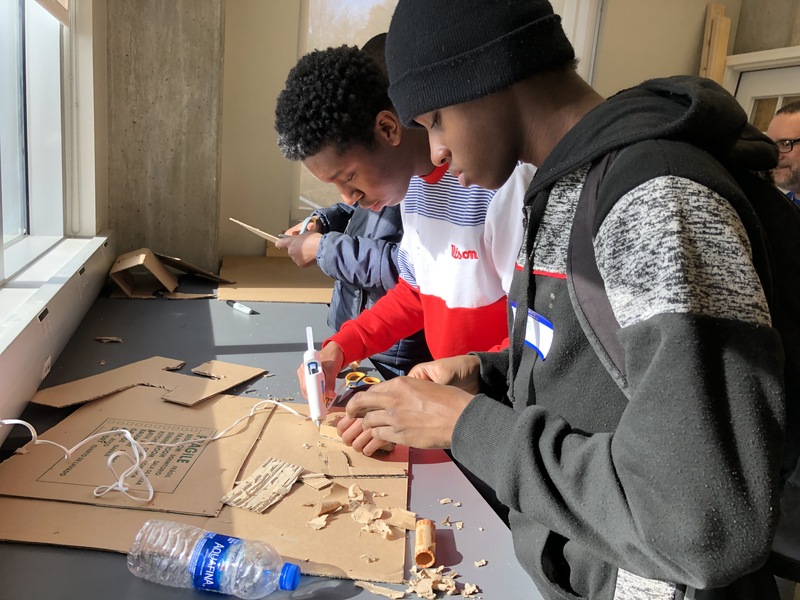 Our KUEST program (KU Engineering, Science, and Technology, pronounced “quest”), is designed to give students from low-income, first-generation, and minority students from middle school to high school, the opportunity to learn how to be engineering and computing creators. For a majority of these high school first-year students, they had never visited the University of Kansas School of Engineering. And many of them still have a difficult time envisioning themselves as college students. 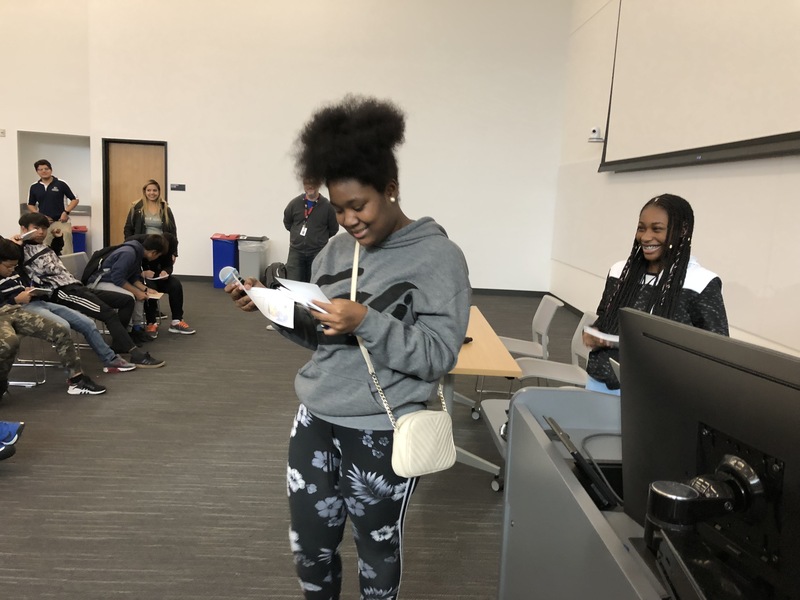 We had KU engineering and computing students, most of them from low-income, first-generation, and minority families themselves, spoke with them about why and how they went to college in spite of the challenges they had to overcome to get to KU. The Schlagle ninth graders also learned about how fun it was to be in college at the University of Kansas. We are excited and grateful to the industry, such as Halliburton and ExxonMobil, and other alumni donor support that we receive to be able to have programs to introduce and engage these students in engineering. To see “engineering innovation in their eyes” for the first time with the hope that soon they will be at KU studying engineering makes it all worthwhile. Diversity inspires innovation. Our IHAWKe engineering students spent this weekend discovering the needs of workers with intellectual and developmental disabilities (IDD) and created solution prototypes to meet the needs, thanks to the support of IBM Analytics in Leawood, Kansas. They spent time creating empathy maps and observations from workers at Cottonwood Industries, a place that employs persons with IDD. One of the surprising motivations for the students was their desire that the workers have fun, social interactions while at work. 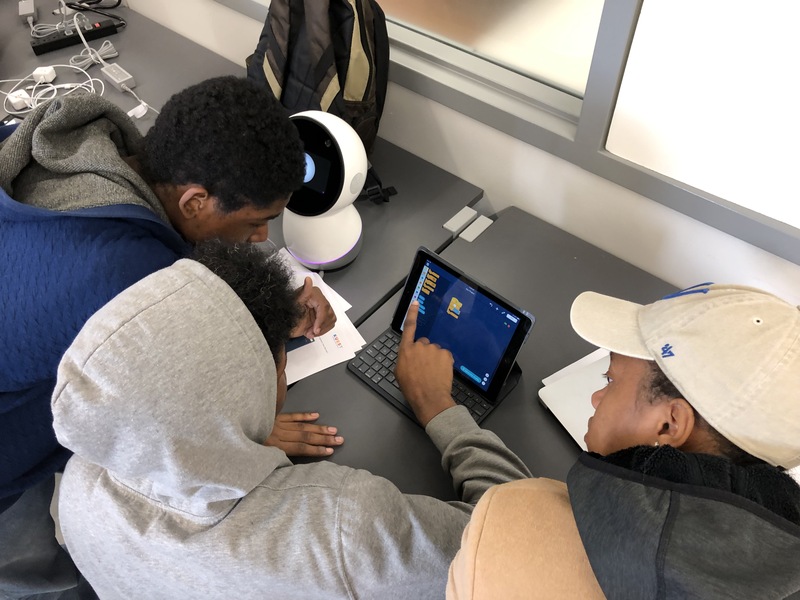 Our IHAWKe students used design thinking to define life changing “how might we” statements, ideation, and prototypes that included emotion and sentiment reading detection devices with a holographic user interface. Some of the IHAWKE team solutions focused on the physical aspects of the disabilities. One solution was a clever application of a humanoid robot assistant. The independence and health of the workers was pinpointed as the students listened to interviews of Cottonwood workers. So the students came up with an exoskeleton-type worker to protect from repetitive stress injuries. Dr. Ken Fischer, Director of KU’s Bioengineering Program and Professor in Mechanical Engineering, Dr. Chenyun Pan, KU EECS, Dr. Mayank Raj, IBM, John from Cerner, Anita from Kansas City Public Schools, and Jill and Kara from Cottonwood provided feedback and advice. IBM generously provided prizes to the students including ones for the most innovative designs and improvisations. 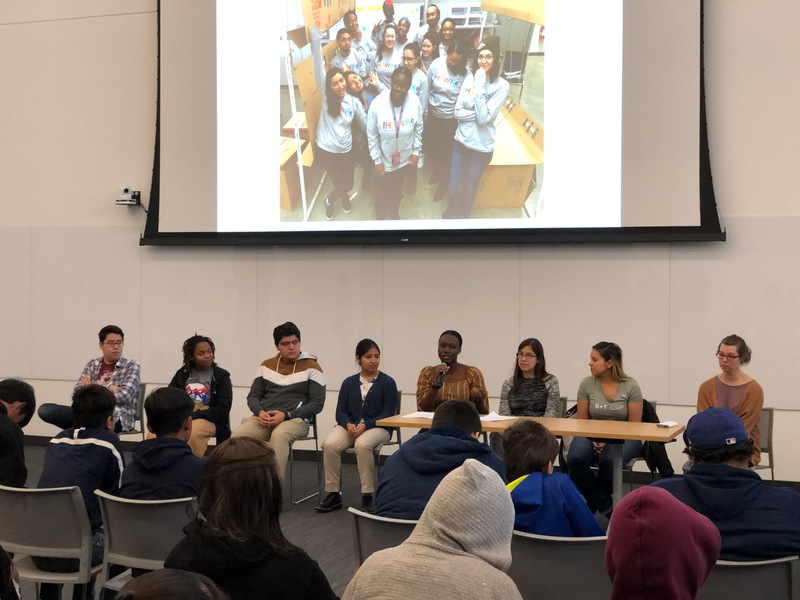 Students from Society of Women Engineers (SWE), National Society of Black Engineers (NSBE) , and KU Women in Computing (KUWIC) along with two students from Haskell Indian Nations University participated. The students were in diverse majors including aerospace engineering, computer science, architectural engineering, mechanical engineering, chemical engineering and information technology. Our IHAWKe students are changing the world with their engineering and computing education and showing how diversity inspires innovation. 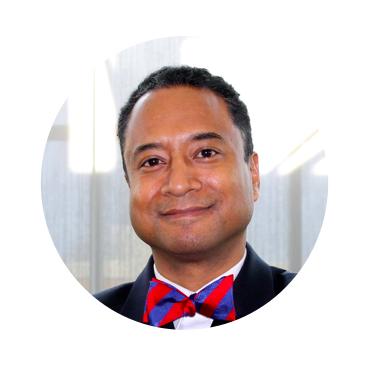 About the Author: Dr. Andrew B. Williams is the Associated Dean for Diversity, Equity, and Inclusive and Spahr Professor of Electrical Engineering & Computer Science at the University of Kansas. Dr. Williams began and directs the IHAWKe (Indigenous, Hispanic, African American, Women, KU Engineering) program and building on the 40+ year old Diversity and Women’s program at KU Engineering that first gave him is introduction to engineering several years ago as a first generation, low income student. This week I was reunited with our January 2017 Teaching and Learning Studio (TLS) alumni from our TLS workshop at Stanford’s dSchool. This year we met at University of Maryland’s Academy for Entreprenuership and Innovation. It was a time to go beyond our five design thinking phases to the 8 Core Design Abilities. Engineers and computer scientists not only need to know the fundamentals of our disciplines but how to creatively approach designing solutions with human needs at the forefront. We had fun at the “Ta-Da” version of TLS doing a Process Remix with interactive tools such as “Zoom In, Zoom Out”, “Wall Flower”, and “Shape Shift”. Thanks Stanford dSchool and UMD Academy for Entrepreneurship and Innovation (Leticia, Dean, Erica, Meenu, Bre, Brooke, Mira, and Tim) for giving us a refreshed design perspective to bring back to our universities and students!